The Wall Street Journal reports that broadcast TV is getting older. Well, of course. TV ran out of (White) young people. As America becomes a bifurcated nation, one of aging Whites with money, and young mostly Spanish speaking Hispanics without money, cultural changes are already transforming America. Rock music has died as a new and engaging creative force, largely because the 1980’s was the last White cohort big enough to support innovation, coupled with the collapse of the Black family (and Church going thus choir training). FM radio such as Indie 103.1 is another example of not enough young White people to support what used to be a money-making institution. 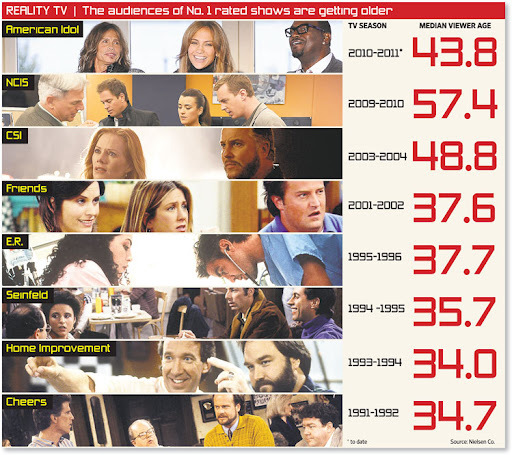 TV is getting older because its is running out of young, White people. And that will in the end, translate to a renewed cultural conservatism and set of attitudes, older people not being known for adventurism and open-ness to new experiences, risk taking, and thrill seeking. Viewers 55-plus make up nearly 60% of the weekly audience for ‘The Good Wife’ on CBS; a 30-second ad recently cost $108,000. Television is starting to act its age. For decades the TV industry has operated on a currency of youth, creating shows that appeal to 18- to 49-year-olds, the age group advertisers traditionally consider most likely to buy new products, switch brands and spend on everything from cars to soft drinks. But as the nearly 80 million baby boomers continue to age out of the coveted demographic—the oldest boomers are turning 65 this year, the youngest 47—networks want to charge advertisers more to reach them. After all, these viewers still watch a disproportionate amount of TV, and they control half of all U.S. consumer spending. From Ed O’Neill’s patriarch on ABC’s “Modern Family” to 51-year-old Hugh Laurie on Fox’s “House,” boomers’ influence can be seen in programming. On “NCIS,” TV’s No. 1 drama with an average viewer age of 57, strapping young naval investigators turn to wise 59-year-old Mark Harmon for advice. TV is just older. The accompanying graphic shows how key shows, have increased their average viewership age, over the years. While Friends and Seinfeld explored the idea of being young, single, and open to all sorts of relationships, or “Summer of George,” in various comic formats, today’s shows such as Blue Bloods are about the duties and responsibility of family. A remarkably conservative message, and one diametrically opposed to that of Friends or Seinfeld or much of anything else in the 1980s through the 2000’s. The idea of family and duty, in the person of a patriarch, hasn’t been seen on TV since the 1960’s and Bonanza. Currently, networks still charge advertisers more for shows with younger viewers. A 30-second ad on “The Good Wife” cost, on average, $108,000 in the fourth quarter of 2010, or roughly $25 per thousand viewers, according to SQAD Inc., a Tarrytown, N.Y., media-research firm. In contrast, on a Wednesday night on top-rated “American Idol,” where the average age is 44, Fox can charge $435,000 for 30 seconds—or about $46.75 per thousand viewers. “Glee,” one of prime-time TV’s youngest shows but whose audience is nowhere near that of “American Idol,” gets $47 per thousand viewers. The networks want marketers to ignore age and pay for viewers based on income and other factors—in effect paying more for affluent viewers who are 55-plus. CBS Entertainment President Nina Tassler says the network has always created shows that appeal to all ages. But “boomers have always been a priority customer for us,” she adds. “Rather than saying a 22-year-old is more valuable than a 58-year-old, we’re saying, ‘Look, the fact is an affluent 58-year-old is certainly more valuable than a 22-year-old who is just getting by,’ ” says David Poltrack, chief research officer at CBS Corp., parent of the CBS network. Marketers are on the trailing edge of the change. Cruise ships are not filled with 20 somethings, they don’t have the money. Neither are twenty somethings going to buy Viagra, or Diabetes drugs, or financial planning products, or retirement advice, or luxury cars, or much of anything in that class. The twenty-something will spend on electronic stuff, movies, and clothes, but his/her ability to do so is under tremendous pressure. The twenty something earns far less than a fifty-sixty something. Gas prices, food prices, and clothing prices can all constrain the twenty something’s ability to spend on consumer goods beyond the basics in a way that older consumers with cushions are less constrained. Inflation and prices rises hurt all consumers, but the twenty something is hurt the most. And … there just is not that many of them, counting Whites. Given that a good portion of the younger residents of the US are Hispanic, with far lower household income (and illegals live in gripping poverty), the growth of young Hispanic consumers is an economic dead zone. Consider an illegal alien, making around $3.50 an hour, the going wage rate in the LA area (minimum wage is $8 an hour). He will not pay taxes, but assuming he works 2080 hours a year (40 hours a week times 52 weeks) that is only $7,280. Assuming he works 80 hours a week, every week, that is still only $14,560. Out of that, he must pay his room/board, his meals, and very likely a crossing fee to coyotes, compounded continuously, with retaliation to his or her family should he fail to make scheduled payments. He or she also needs to send money home (most illegal alien workers tend to be male, however). That’s not a lot of free cash. What are the likely outcomes of a shift therefore, in TV and culture to an older, more affluent, and increasingly numerically inferior White group? The first is the end of open-ness to Mexican culture. Punk and Pop bands in the 1980s, from Wall of Voodoo (“Mexican Radio”) to X, the Blasters, Los Lobos, the Minutemen, all incorporated various Mexican themed sounds and songs. It is remarkable, with Mexico such a huge influence on America’s future, and comprising essentially a great deal of America’s population, how absent Mexican culture is in current American music, films, TV, and so on. Only in food, has Mexican influence been felt. This is not surprising. Open-ness to another culture depends on not being threatened by it. With the population replacement/displacement characterized by defacto ethnic cleansing, no-go areas, Whites as minorities in their own nation, the ability to be open and accepting of other cultures, let alone the one doing the replacing, is pretty low. White elites that listen to NPR currently don’t feel threatened, and find their “real enemies” are ordinary Whites in the suburbs. But culture is not made by NPR or PBS. Young White kids find themselves isolated and outnumbered, and so unlikely to adopt Mexican musical culture, or much of any other parts of Mexican culture. At any rate, there are not enough young White kids to provide an audience and the critical mass for experimentation followed by commercial break-throughs. There is is no equivalent to a modern day Elvis, putting together the dance elements of Western Swing music, the soul-fulness of gospel, and the simplicity and emotional power of the blues. There are not enough White kids to supply a critical mass of young boys noodling around on their guitars in a garage, in off hours, and not enough White kids to provide the few that have anything new with an early, accepting audience (and early commercial success), and even less open-ness to borrow from other cultures when your own is under constant threat. Instead, all musical innovation essentially stopped sometime in 1988. The model is now conservation of what exists, rather than creating something new. That cultural message, one that is accepted by both young and old, mostly, is of itself extremely conservative. You can see this work itself out in what new electronic products generate buzz. Ipads are just another form of a computer. They might be cheaper, more mobile, and more handy for things on the go than older computers, but they are still just a computer. They aren’t flying cars, or laser weapons, or teleportation devices, or invisibility cloaks, or anything like that. And the cultural content on them tends to be re-runs of the A-Team, from the 1980’s, or other nostalgia fare. Aimed at wealthy boomers as much as young twenty somethings. Economically, power is shifting, from companies catering to young people, Facebook and Twitter valuation bubbles aside, to those who create products aimed at the middle aged and middle class. With evolutionary changes not revolutionary changes in the offing. A better phone, not a flying car. America has become, in one sense, a very conservative nation, culturally. And that change is driven by demographics. We just ran out of young White people, and that change is likely to work itself out in business, politics, and culture. Mostly in an aversion to change, risk, and all the brave new hype of a post-White America. The people who watch Kathy Bates and Tom Selleck are not interested in “Machete.” If anything, they are focused on maintaining the character and aspect of America as it was in 1984 or so. This entry was posted in age, culture, demographics, more, politics, tv, wealth. Bookmark the permalink. TV is an old, female, gay ghetto. This is where you are wrong Whiskey. The older generation is mostly liberal hippie or libertarian and since they are little young people the old Boomers can't continue indoctrinating their worldview on youth in a grand scale anymore. What is happening is older liberal hippie dying out, some libertarian influence on the middle aged people and young people that care less about politics and liberalism than facebook and toys. It may perhaps translate into traditional conservatism and there are signs of this happening but it's occuring slowly. Sorry I meant since there are little young people (smaller numbers of youth). Instead, all musical innovation essentially stopped sometime in 1988.There was grunge rock in the early 90's. I considered grunge to be the "last harrah" of rock music. Later, there was techno/rave/trance dance music. Although originally created by blacks in Detroit and other places, this rapidly became a white music as blacks were into mostly hip-hop and R&B. Since then, there has been essentially no innovation at all in music, either by whites or blacks. The oughts were the first decade without a new kind of music since the 1910's. Another good post, Whiskey, though I'm going to take a little bit of umbrage at your characterization of music not undergoing innovation in the past 20 years. It has undergone a ton of innovation, more than it ever has, but this innovation has remained mostly subterranean, and on a fundamental level, has there been any innovation on the level of the creation of electronic music, or jazz, or metal music (or even rap)? Not really. Basically, what has really happened is music has splintered into a million subgenres (and these tend to be picked up on primarily by the diminishing supply of white kids, particularly SWPL and suburban types). Let's take metal for example, just a few subgenres off the top of my head: thrash metal, sludge metal, death metal, progressive metal, black metal, metalcore. Now, you may ask, how much mainstream exposure do these subgenres get? *That* is the point. The innovation has been almost entirely underground (relatively speaking), though elements will be picked up by mainstream artists and producers in a safer, more radio-friendly way. Maybe not so much with metal, which has never been a real chart-topper, but this applies to other genres that undergo constant innovation, electronic music in particular.There has been a ton of innovation in music, but in a sense, the totality of what has happened generally jibes with what you say. The demographic splintering of the nation, the near-extinction of truly mass culture: this means the innovation has mostly stayed underground. Mainstream music will slowly pick up on this innovation by changing its production style and aping some trends, but it's hard to really pinpoint any recent, fundamental changes at the mainstream level. There was the arrival of rap in the mid-80s. You can probably count the advent of alternative rock, which is still fairly popular on radio, and which you may have been going for with your 1988 date. Electronic dance music also reached a high level of popularity by the early 90s, but that has largely remained a European and not American phenomenon. Besides that… I guess you may be able to include indie rock music from the 00s. The kids certainly listen to it, but it still doesn't chart or sell that well, and really, the genre has been around in some form since the college rock of the 80s.Ah… that was actually kind of fun to ruminate on. Thanks for inspiring some reflection on the topic! Here is a brief review of the rise/fall for rock in the USA and the population of young white adults who listened to it: Mid-Fifties: Rock is born, Elvis, Bill Haley and the CometsLate-Fifties: Pat Boone, Ricky Nelson, Buddy Holly, Rock starts to push out competing musical styles.Early Sixties: The Twist (Chubby Checker) & Surf Music, Top 40 Radio is immensely profitable and expands.Mid Sixties: The British Invasion(Beatles, Stones, Who), Rock starts to become a Tidal Wave and dominates all Radio.Late Sixties: Psychedelic Acid Rock, Protest Rock, Rock is the soundtrack to the Boomers life.Early to Mid Seventies: Stadium Rock (Led Zeppelin) Hard Rock dominates radioLate Seventies: Boomers start to loose interest in Rock somewhat, Disco challenges Rock for Dominance.Early Eighties: Disco Fades, Punk Rock & New Wave … listened to by trailing edge boomers and Gen XLate Eighties: Rap starts to show up, give alternative Rock a run for it's money.Early Nineties to Mid-Nineties: Grunge Rock (Nirvana). Metal Rock & Indie Rock still dominate radio.Late Nineties: something happens, Rock fades, MTV stops showing music videos, Rap dominates Radio, Pop & Country emerge stronger than Rock Early 2000's to today: Music splintered into many many sub-genres, Mainstream Rock Stations no longer profitable, actually music industry (with perhaps exception of Country) overall unprofitable. Great music in all these genres being produced, but audiences are small.I believe the falling off of popularity of Rock occurred in the late 1990's, most likely as you assert that the population of young white kids who are the natural audience, their tastes have changed, and there are fewer of them.Not sure where this will end. The continued fragmentation of the audience may mean there is interesting music produced out there in a dozen genres, but nobody pays for it. For Whites, Country looks like the only genre on Radio that still can make money because country fans are so loyal, and actually still buy CD's. I'm not sure if the take on heavy metal is correct. Near as I can tell, most modern metal is just some combination of Van Halen, Metallica, Dokken and Malmsteen/Vai/Satriani shredders.Essentially, 90's and 2000's metal is just re-hashed 80's metal. If twenty-something are debt ridden, inflation doesn't hurt them nearly as much as you claim, but that's long term. @Map: Lot's of novel metal out there. Mastodon, Baroness, others fusing post thrash and grind with prog for a start. You've got black metal coming in from Scandinavia, I don't know if you want to term symphonic bands like Nightwish metal, but there's that, too…Along the lines of what DJF said, the internet fragmented everything, rock included. Physical copies of music and mass market radio is no longer needed to reach and deliver music to consumers. This allows for smaller sub-genres to do well within their niche of a fragmented market.Metallica went platinum without the help of radio early in their career and metal survived just fine in the early ninties when grunge was the rage. It'll continue to do fine on the back burner as straight, middle to lower class white males will still buy it. They aren't going to pick up Lady Gaga records no matter what the marketing push. The older generation is mostly liberal hippie or libertarian…This is nonsense. The older generation of Americans are either left-liberals or social conservatives. Principled libertarians are an insignificant part of the population. Being socially liberal does not make you a libertarian. How many people in this country do you think have actually read von Mises? Let alone understood him?Whiskey sure hasn't. I wonder what the reaction would be if VDare or AmRen had a weekly TV show. Aside from the expected hub bub from liberals, my guess is that it would attract a huge audience. Another production of the "nice and kind" person raised by responsible parents in what is called AmeriKKKan KKKulture.Just using her freedom of speech and her own feelings and thoughts, her God-given rights, to share with others.Most instructive, most revealing. The AmeriKKKan form of narcissism/exhibitionism. Hmm. It might be that the "something happens" referenced in djf's timeline is the coming-of-age of a generation with millions of missing members, thanks to Roe v. Wade.